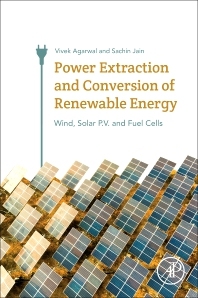 Power Extraction and Conversion of Renewable Energy: Wind, Solar P.V. and Fuel Cells provides a detailed analysis of the various power converter operations fed by solar PV and other renewable energies. Practical aspects addressing the behavior of systems, such as the operating point on source characteristics and the buckling or boosting of power converters when power converters are considered, as are the fundamentals to effective use and applications of renewables. Computer simulation models for typical systems give the reader a deeper insight and “feel” for the actual systems the book details. It provides readers with a tool to develop, design and achieve successful power extraction. Renewable energy alternatives are fast becoming viable options to battle conventional fossil fuels shortcomings, such as pollution, cost and limited reserves. Understanding the requirements and source characteristics for successful power electronics and their application is pivotal to extracting power successfully. Professor and Institute Chair Professor, Department of Electrical Engineering, Indian Institute of Technology – Bombay, India, Fellow, Indian National Academy of Engineering (FNAE); Fellow, IEEE, USA; Fellow, IETE, India and Life Member, ISTE, India. Fields of interest include Power conversion, Power quality, Renewable energy and distributed energy systems, Intelligent control of power electronic systems and Electronic systems. Assistant Professor, Department of Electrical Engineering, National Institute of Technology, Warangal, Andhra Pradesh, India. Fields of Interest include Grid-Tied PV Inverters, Design and optimization of power supplies, Power electronic circuits modeling and simulation, Switch-mode power supplies, Power Electronics and its interface with other Renewable sources.